First off, read the entire step before you do anything, it often times won't make sense until you read the whole thing. Read first, then do. Secondly, always always always use the buttons at the bottom of the page. The buttons that say 'Continue' 'Return to the Archives' etc., you need to click these. If you don't the next step might not open for you, causing major difficulties. Okay, now that that's covered, lets begin. To start the plot, you need to go to Altador. Click on the Hall of Heroes. See the little Yurble janitor? Click on him. supposed to do something, but I can't figure out what." The button he is referring to is that sun-looking thing to his left, you'll see it on the right side. Click the button. You push the button. Nothing appears to happen. The Janitor seems very angry about this. "I TOLD YOU! It doesn't do anything!! Why did you push it anyway?! RAARGH!!'" The janitor flails his mop around angrily. Now it's time to visit the Altadorian Archives. Click the door on the right to visit Finneus, the archive keeper. here in the archives that might tell me something." Yes, a book... but where would we find one of those? Oh! There's one under his table! 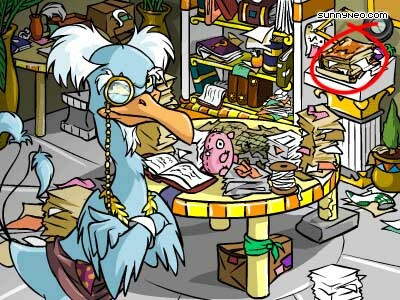 Click the book under the leg of the table, see it, with the orange cover? exactly three inches short. If only I had something to replace it..."
Looks like we need something exactly three inches tall! What better than a rock? But where could we get a perfectly flat three inch rock? Where better than the Perfectly Flat Rock Quarry?! Yay! Now back to the Archives. Click on Finneus' door. Re-click that orange-covered book to replace it with the perfectly flat rock we found. You replace the book with the Perfectly Flat Three-Inch Rock. It's an exact fit, and the table is completely stable! You can click on the book now which Finneus has placed on the Pedestal. Pages 1, 2, and 3 are the only pages that have anything written so far. Click the page folds at the top to flip pages. Now that we've gotten the book, it's time to pay a visit to our friend the janitor. to grease the gears, the button might do something again." Easy enough... back to the janitor. "Oh, you found the oil I use to polish the plaques! Good idea! mechanism, and we'll see what happens." Well...? Push the button again! up, admitting much more light to the room! you" in a friendly way. When you return back to the Hall of Heroes you'll notice that it is much brighter now. You may have figured out (or you may have not) that when you click on a statue you can click the tippy top of the picture to see a series of blue gems above their head. We'll look back here later on. If you are a little explorer, you may have also noticed that the staircase behind the statue of Gordos is clickable. This will take you to the Observatory. of dome-shaped room atop the Hall of Heroes. Take a trip the Archives. You'll notice that there is a new flyer on the board. Click it to go to the Astronomy Club. to be advertising an Astronomy Club! When you get there, you will be greeted by the club president. phenomena, see ancient nebulae, and identify constellations!" "Hi! We'd be glad to have you in our club!" The president of the Astronomy Club welcomes you warmly. Click 'Join the Astronomy Club'. somewhere reasonably high-altitude to use it." High altitude, eh? 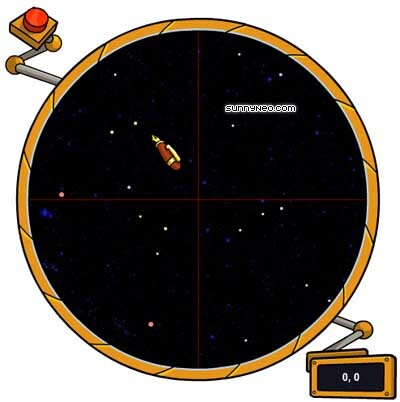 How about the Observatory? If you click on the telescope stand you can now view the stars. The janitor and Finneus have something to say about your new membership, if you'd like to check in on them. eh? That sounds like fun. I wish I had the time to join a club." the heavens, and mapping the intricate patterns of the cosmos?"